Bastille Day celebrates the birth of the French Republic. It takes place on the 14th of July. 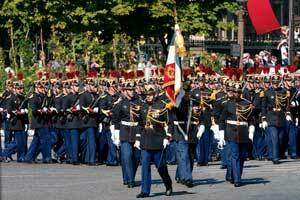 This holiday is celebrated by a grand military parade and colorful art fairs. There is also many parties on Bastille Day too. It is a public holiday, so schools, offices, and businesses are closed. Bastille Day became an official holiday July 6, 1880. The French had gathered into an uprising in hopes to take control of their country and marched on the Bastille. Storming on the prison was the beginning of the French Revolution and standing up against oppression.